Caribbean Connector: VTLS Announces The RDA Sandbox! 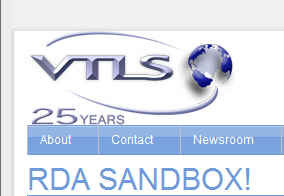 VTLS Announces The RDA Sandbox! VTLS Inc. announces its sponsorship of The RDA Sandbox, a special program designed to provide tools by which Libraries and librarians can practice creating MARC records following the Resource Description and Access (RDA) Implementation One Scenario. Participants in the program will have access to a Virtua™ database with over 250,000 MARC FRBRized linked records. Participants will also be provided with a specially customized Virtua Cataloging Client that will allow them to create and modify their own RDA records in the shared database. Virtua, a remarkably intuitive, full-featured integrated library system, has been configured with a simplified interface specifically designed for The RDA Sandbox program. Special user’s guides and other documentation, as well as email support services will be provided. An online forum for participants to post comments and compare notes will be offered as well. The cost for participation is only $60; however, the first individual from the first 20 institutions that sign up will be given a credit back on their credit card that is equal to the amount charged. The program is open to librarians across the globe (although not to competitors of VTLS Inc! ), and will run now through January 2011.